Coconuts are renowned for their hard shells, which are vital to ensure their seeds successfully germinate. But the specialised structure of coconut walls could help to design buildings that can withstand earthquakes and other natural disasters. Coconut palms can grow 30 m high, meaning that when the ripe fruits fall to the ground their walls have to withstand the impact to stop them from splitting open. To protect the internal seed, the coconut has a complex structure of three layers: the outer brown, leathery exocarp, a fibrous mesocarp and a tough inner endocarp surrounding the pulp which contains the developing seedling. 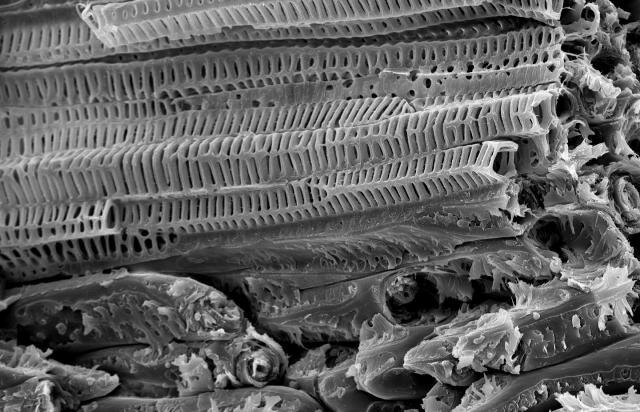 As part of a larger project on "Biological Design and Integrative Structures", researchers at the Plant Biomechanics Group of the University of Freiburg have been working with civil engineers and material scientists to investigate how this specialised structure could be applied in architecture. The researchers used compression machines and an impact pendulum to investigate how coconuts disperse energy. "By analysing the fracture behaviour of the samples and combining this with knowledge about the shell's anatomy gained from microscopy and computed tomography, we aimed to identify mechanically relevant structures for energy absorption" says plant biomechanist Stefanie Schmier. Their investigations found that within the endocarp layer - which consists mainly of highly lignified stone cells- the vessels that make up the vascular system have a distinct, ladder-like design, which is thought to help withstand bending forces. Each cell is surrounded by several lignified rings, joined together by parallel bridges. "The endocarp seems to dissipate energy via crack deflection" says Stefanie. "This means that any newly developed cracks created by the impact don't run directly through the hard shell". It is thought that the angle of the vascular bundles helps to "divert" the trajectory of the cracks. The longer a crack has to travel within the endocarp, the more likely it is that it will stop before it reaches the other side. The distinct angle of the vascular bundles in the endocarp could be applied to the arrangement of textile fibres within functionally graded concrete, to enable crack deflection. "This combination of lightweight structuring with high energy dissipation capacity is of increasing interest to protect buildings against earthquakes, rock fall and other natural or manmade hazards" says Stefanie.